For the Tiger/Leopard Mac users out there, you’re probably interested in something artistic by nature. Whether its editing photography, listening to music, or writing HTML/PHP code (my personal favorite), Mac OS X empowers the creative side in computing. Consequently, any time there’s an opportunity to “enhance” a mode of creativity, I jump at it, and I believe I’ve come across such a chance (in reality, I came across it three months ago but have only now decided to publicize it 😉 ). SRS iWOW, an iTunes plugin, is one of the most extraordinary audio enhancement plugins I’ve come across on any of the operating systems I use. This plugin is the solution for those looking to enhance the dingy built-in speakers of their MacBook or the $5.99 headphones you purchased from CVS (I’m guilty in either case, heh). iWOW provides a simple integration with no noticeable impact on system resources. It provides seamless audio playback (not like some plugins which occasional skip as they render) and can be adjusted to achieve virtually any type of output you want – even karaoke mode! Whether it’s sliding a bar to adjust the bass level, selecting a preset scheme via a drop-down menu, or increasing the overall output volume for those songs which are still inaudible even at your Mac’s highest volume setting, usability is the fundamental concept of iWOW. The simple interface allows even the most novice Mac user to enjoy an iTunes experience which, in my opinion, is a night and day difference from the default. 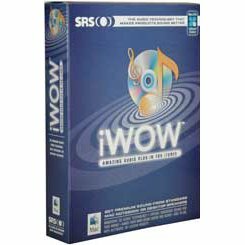 At a $30 price tag, SRS iWOW is a “must have” plugin for those who routinely listen to music on their Mac notebooks/desktops. Leave me a comment if you’d like more details! does it increase the volume of the older macbooks? How old is “older?” In other words, do you at least meet the minimal software requirement of running Mac OS X Tiger or Leopard?